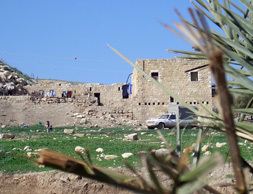 Above: Since the Occupation took control over land and water in the Jordan Valley, this ancient hotel could no longer be used. The beautiful natural resort and the life of the people in the area are being destroyed for Zionist geo-strategic interests. Wadi el Maleh, in the northern Jordan Valley, is an ancient resort used for centuries by visitors and the local population for its hot mineral springs. What has been a bustling tourist facility, until the occupation of the Valley in 1967, is today a site where Palestinians struggle to exist. The Palestinian community in Wadi el Maleh – over 500 strong – are currently forced to live in tents. The Occupation prevents the construction of buildings and ensures no transportation or basic social services can reach the community. To obtain medical care, or in emergency cases, people need to go to Tobas located 13 km away. Since the beginning of the Al-Aqsa Intifada, the Tayaseer checkpoint has severely impeded Palestinian movement in the area. With intensified closures over the last few months, as the Occupation steps up Judeaization of the Valley, Palestinians are increasingly prevented from accessing health, social and educational institutions in Tobas. As a result of the deterioration of living conditions, a small clinic was installed in a tent in the village in January 2006. Now, in an attempt to break the spirit of the community, the Occupation has marked the service for immediate destruction. Soldiers arrived in the village on Sunday 23rd of May, noting that the tent was to be dismantled or they would return to destroy it. 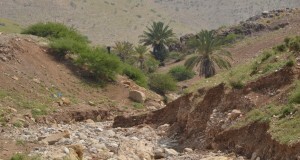 The main life source of people in Wadi al Maleh is currently cattle farming. The Occupation from 1967, not only destroyed the traditional hotels and khans in the area, but also declared the whole area a military training zone. 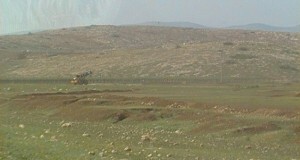 Farmers are continuously threatened when grazing their cattle by military training operations held on their lands. Even access to the hot springs and their water has become difficult in recent weeks, as Zionist tourists have descended upon the area in greater numbers. 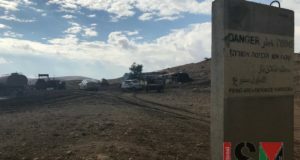 The community of Wadi el Maleh is under threat from expulsion as the Occupation seeks to Judeaize the Valley and shape a new permanent reality of annexation.